According to Forrester Research, people are 75% more likely to watch a video than read a document, e-mail or online article. This new reality has huge consequences for the way in which people will communicate in the future. So it’s no longer a matter of whether to use online videos or not; instead, they are an absolute must if you are to be seen and heard at all. Many communication messages are ideal for inclusion in a short online video. However, messages with more substance, depth or impact deserve more attention – and a webinar ensures that they receive it. For example, the average viewing time for live webinars stands at 57 minutes. 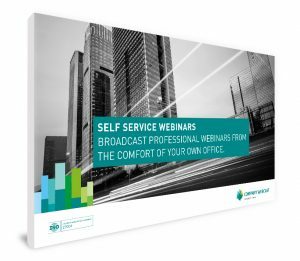 Your personal Self Service licence enables you to organise as many professional webinars as you like, on your own and from the comfort of your own office. For more information about the possibilties, download our free brochure by filling in the form below. Please fill out the form below to receive the Self Service brochure.